Cisco IP SLAs is a part of Cisco IOS that allows Cisco customers to analyze IP service levels for IP applications and services by using active traffic monitoring for measuring network performance. With Cisco IOS IP SLAs, service provider customers can measure and provide service level agreements, and enterprise customers can verify service levels, verify outsourced service level agreements, and understand network performance. Cisco IOS IP SLAs can perform network assessments, verify quality of service (QoS), ease the deployment of new services, and assist with network troubleshooting. In this article, I will use the ICMP Echo operation measures end-to-end response time between a Cisco router and a web server using IP. Response time is computed by measuring the time taken between sending an ICMP Echo request message to the destination and receiving an ICMP Echo reply. 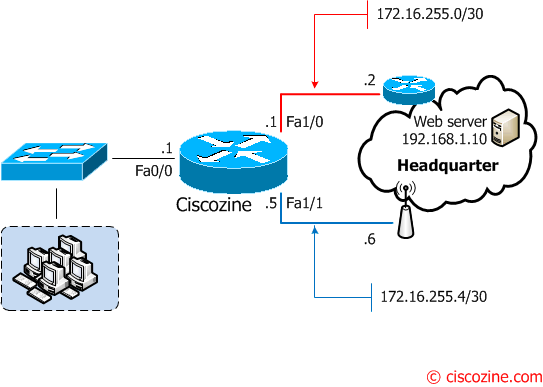 Suppose that the Ciscozine router has two different links, one is the main connection (red link) and the other one (blue link) is the backup connection; the question is: how can I enable the backup link if the main connection goes down? In general, the best solution for this scenario is to use the dynamic routing protocol, but what can I do if I can’t use them? The solution is the IP SLA. 1. Define the ip sla operation. The Ciscozine router will send an ICMP request to 172.16.255.2 (the Ciscozine default gateway) every 10 second with a timeout of 1000ms and a threshold value of 500ms. 2. Start the ip sla. It is possible schedule the SLA operation in different ways but in this tutorial I want to start the ip SLA operation immediately and forever. Notice that the “1” refers to “ip sla 1” command. 3. Track the state of IP SLA. Every IP SLAs operation maintains an operation return-code value. This return code is interpreted by the tracking process. The return code may return OK, OverThreshold, and several other return codes. Two aspects of an IP SLAs operation can be tracked: state and reachability. In this case, I prefer to use the “reachability”, so the “track state” will be down only in case of a ICMP timeout. Remember: If you want to use the “state”, remember that the “track state” will be down also if the the threshold is reached. Note: with Cisco IOS Release 12.4(20)T, 12.2(33)SXI1, 12.2(33)SRE and Cisco IOS XE Release 2.4, the track rtr command is replaced by the track ip sla command. See the track ip sla command for more information. 4. Define the tracked route. At the end, I must delete the old default gateway entry, add the default gateway with the track feature (notice that the number 10 represents the track object defined in the previous step) and insert a default route with a distance administrative less “strong” . Hence if the track status is down the last route will be used to forward all the traffic (notice that the number 5 define the administrative distance). 5. Check the IP SLA. Now that I have defined the IP SLA object, I can check some useful informations when the main link (red link) is UP or NOT. May 8 03:23:30.082: %TRACKING-5-STATE: 10 ip sla 1 reachability Up->Down.!!!!!!!!!!!!!!!!!!!!!!!!!!!!!!!!!!!!! the route tracked goes down and the backup default route (ip route 0.0.0.0 0.0.0.0 172.16.255.6 5) is up. As you can see, when the main line comes up (now the default gateway is again 172.16.255.2), there isn’t a packet lost. With Cisco IOS IP SLAs, service provider customers can measure and provide service level agreements, and enterprise customers can verify service levels, verify outsourced service level agreements, and understand network performance.